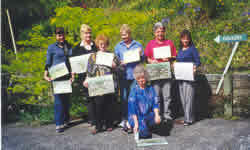 2 Day painting workshops with Jan Alldritt-Miller. SUITABLE FOR BEGINNERS OR THE MORE ADVANCED STUDENT. 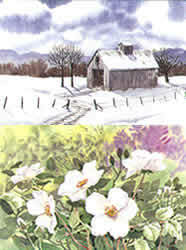 Jan has tutored adult art for over 30 years. Jan is using acrylics as watercolours and feels that so often students are precluded from attending workshops where they have a long list of materials to purchase that they may not use again. In view of this Jan provides all materials for the 2 days. Jan's method of tutoring is very formularised and an "old fashioned" approach - the basics of practical painting. 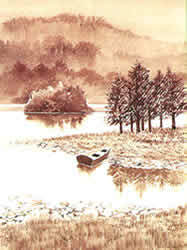 The subject matter of the workshops is not the important factor - they are purely vehicles to learn all the techniques, rather than the production of "saleable" paintings . Workshop one begins with a talk for an hour or so on her materials and why and how she uses them. Then follows some valuable tips on composition, perspective etc (this is only for the first workshop, and this ground never needs covering again !). Next comes the step by step demonstration of the 4, hopefully 5 paintings shown. NO NOTES need to be taken, as every student receives a folder containing detailed illustrated notes on everything covered, and each painting completed. Workshop two can follow some months later (participants must have done workshop one). The subject matter is as shown and also includes a valuable lesson on basic perspective. Again no notes need to be taken. *The number of participants on the workshops is limited only by space and the number of people who can comfortably fit around the demonstration table. In response to requests for further follow-up workshops, Jan has produced a number of images suitable for 1/2, 1 or further 2 day courses. Subject matter for these includes a bird's nest and foliage, little girl squatting in the sea, birds on a wire, English village and a large floral painting. Workshops usually commence at 9:30 am and finish at around 4:45 pm. As there is so much to be covered in workshop one, we try to "eat on the go" with only short breaks. Workshop 2 is a little more leisurely. The cost varies according to venue, travel required and size of groups. For one person, at Jan's studio the cost is $ 495 including G.S.T. Remember this price includes ALL materials, notes etc and substantial morning and afternoon teas and lunches. A discount is given for couples or groups. 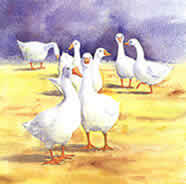 Likewise fees to art societies are considerably discounted depending on distances and numbers. N.B. In almost all cases grants can be applied for by art groups for help with running workshops.